A starving polar bear standing solitaire on a small block of ice lost in the majestic ocean. When people think climate change, this is the impact that the media and political rhetoric often harken. But to those at the forefront of climate change, there is significantly more at stake. There is not only an Indigenous way of life but also the lives and homes of many northern communities. This is the real impact of climate change. Not to negate the environmental effect, but the human impact is very tangible, yet often ignored or pushed aside. However, there is a shift in the winds surrounding the discourse. More and more, in international conferences, in political discussions, and in academia, there is an acceptance that what is happening in the Arctic has tangible and immediate impacts and, more importantly, is a violation of the human rights of people living in the north. Rights that include health, food, adequate standards of living, and, on a deeper level, the liberty to maintain social and cultural rights to ensure the development of their personality. People are looking towards Traditional Knowledge (TK), known as Inuit Qaujimajatuqangit (IQ) to many northern Indigenous peoples, as well as Western scientific knowledge to solve what many now recognize as a human rights issue. As early as 2007, Ms. Sheila Watt-Cloutier, a previous chair of the Inuit Circumpolar Council, went to the Inter-American Commission on Human Rights to declare that climate change was not only a human rights issue, but that countries facilitating climate change, such as the United States, were violating the human rights of the Inuit people. This petition was crucially important in how people saw climate change. In a foreword to the UNEP study on Climate Change and Human Rights, John H. Knox, the UN Special Rapporteur on human rights and the environment said, “the Inuit petition was the first harbinger of a sea-change in how the international community thinks about climate change.” Climate change is threatening the ability for Inuit peoples to thrive in their own culture, one that is dependent on hunting and navigating the dangerous and changing ice; the Inuit peoples have known that this was a violation of their rights for almost ten years. IQ is no longer allowing for the same levels of safety as it did before; a knowledge that allowed people to flourish safely in the north. A direct example of this is the ability to rely on snowdrifts as a method of ensuring safe transport home; with the impacts of climate change the winds have been coming in from new directions, leading to hunters being stranded away from home, not being able to depend on their traditional knowledge of the land. Furthermore, with the thinning of ice, hunters – even the most experienced — are also being put at risk due to potentially falling into freezing waters which can kill in minutes. The impacts of a warming and changing climate are dramatic in the north, where the snow and ice is crucially important to maintaining and thriving in a traditional lifestyle. Due to the transforming environment, there are many problems: problems with hunting – due to either a lack of or a change in the animal’s behaviour; problems with methods of travel – as sea ice melts, it become increasingly dangerous to rely on as a method of transportation; problems with infrastructure – both in creating new traditional housing and dealing with the implications of houses that were built on what was believed to be permanently frozen land. These are all directly impacting the lives of peoples in the north, and some of them are not restricted to Indigenous peoples’ traditional ways of life, but simply living in the north. Yet, it is not all doom and gloom. 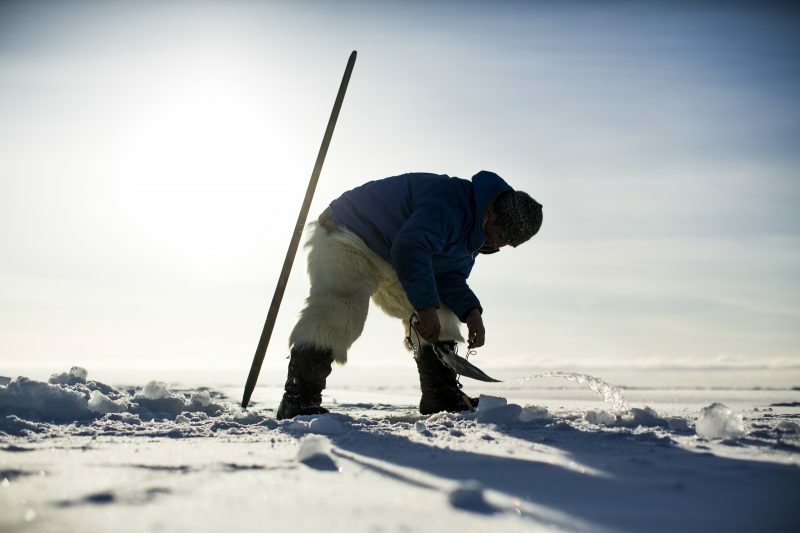 Yes, climate change is happening, and yes, the impacts on Indigenous peoples in the north are escalating, but the Inuit have lived in some of the harshest climates in the world for many years. And they will continue to fight for their livelihood and their culture, and their ability to win this fight will in large part be due to the history and tradition they have of adapting and working together in isolated and often dangerous landscapes. “Although the environmental changes are happening much quicker now than ever before we are resilient in the north in large part because of the long traditional history we that have available to draw from,” says Colleen Healy, the Nunavut government’s climate change coordinator. “IQ is one of the greatest resources that we have for adaptation in the Arctic.” Adaptation remains key for the Inuit peoples, but this does not mean that part of this adaptation is giving up their culture. These changes are appropriate to talk about in the wake of the Paris agreements that many countries signed on Earth Day. These talks once again brought forth the reality of what climate change means not only for the Inuit peoples, but also for our society, our species, and ultimately our world. However, what often happens at international negotiations happened once again in Paris. The rights of Indigenous peoples were relegated to a non-binding part of the agreement. “Acknowledging that climate change is a common concern of humankind, Parties should, when taking action to address climate change, respect, promote and consider their respective obligations on human rights, the right to health, the rights of indigenous peoples…” (bold emphasis added). When using the word should, the international community creates a non-binding clause that relegates Indigenous rights to the background of the discussion. What cannot be negated is the importance of this treaty in general, as the first internationally binding agreement on climate change, but more specifically the recognition that this is the first time in a legally binding UN document that Indigenous rights have ever been unqualifiedly included. It showed that, at last, countries around the world are accepting the Indigenous rhetoric surrounding these issues and the language of Indigenous rights. The Torres Strait Islanders, an Indigenous peoples living between Australia and Papua New Guinea are also struggling with climate change. According to a case study by the Australian Human Rights Commission, they are dealing with increased erosion, stronger winds, more storms, and what appear to be the roughest seas that elders have ever seen or even heard of. Due to the low lying nature of the islands that the Torres Strait Islanders live on, not only are their changes in the environment and climate that are a concern, but the very land they live on. Much like the Inuit in the north, they depend on the land and gain much of their traditional and culture from being on it. With increasing ocean levels, this could all end. According to the Intergovernmental Panel on Climate Change, an assessment made as early as 2007, said that, “climate change is projected by mid-century to reduce water resources in many small islands, e.g., in the Caribbean and Pacific, to the point where they become insufficient to meet demand during low-rainfall periods,” and that, “Small islands, whether located in the tropics or higher latitudes, have characteristics which make them especially vulnerable to the effects of climate change, sea-level rise and extreme events.” Although the arguments are not new, the fight for governments and people to realize that climate change is not only a human rights issue, but one that needs immediate solutions continues. Climate change is a human rights issue, one that negatively and unevenly affects Indigenous peoples often due to their more remote and often traditional locations. The Inuit peoples in the north as well as the peoples living in the Pacific Islands are but two examples in an ever-increasing group of peoples fighting for their rights as human beings. Rights that, although they are finally being talked about on the international scene, are still not always recognized, as the Paris agreement once again showed. The north has always been cold. This may seem like a simple statement, but what many do not realize is that in the north, colder can often be better. This means more safety in travelling, security in infrastructure, and although counterintuitive, the ability to be warm. Ms. Watt-Cloutier wrote a book called The Right to be Cold, and this title rings true. The Inuit peoples have the right to be cold; they have the right to maintain their traditional lifestyle; and they have the right to life. If climate change is impeding that, then it is the responsibility of governments to ensure that this stops.